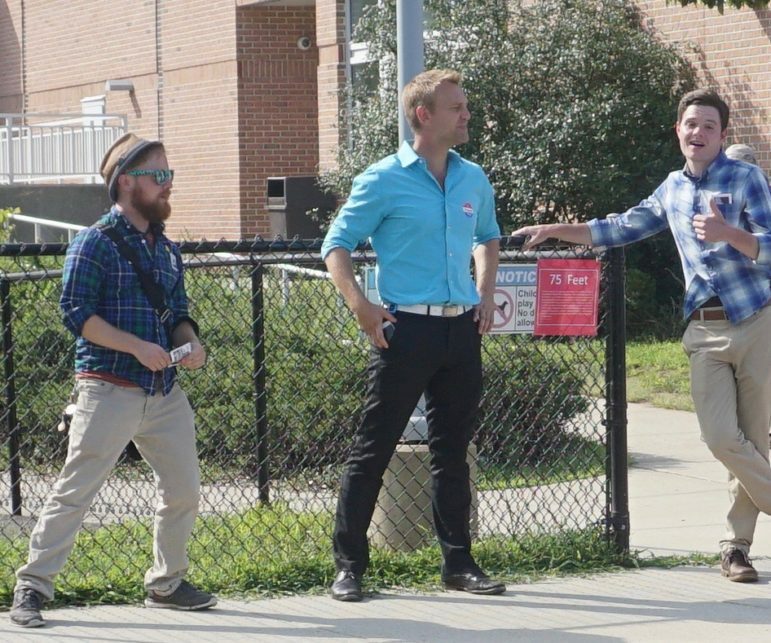 Joshua Elliott, center, at the polls. At left is a Working Families field worker. The Working Families Party was the biggest outside spender on Democratic legislative primaries Tuesday, committing $70,000 for field staff in three winning races, while two charter-school groups provided late support to help Rep. Charlie Stallworth of Bridgeport defeat a prominent opponent of charters, Maria H. Pereira. Working Families’ political action committee, Action for Working Families, reported hiring an unspecified number of field workers to support Sens. Marilyn Moore and Ed Gomes in Bridgeport and Joshua Elliott, the candidate recruited to challenge for retiring House Speaker J. Brendan Sharkey’s seat in Hamden. According to an independent expenditure report filed with the State Elections Enforcement Commission, the party’s PAC incurred expenses of $40,000 to support Moore, $20,000 for Gomes and $10,000 for Elliott. All three are liberals supportive of a higher minimum wage, and all three were denied the endorsement of the local Democratic organizations. Action for Working Families did not list the names or numbers of field workers, details the commission is encouraging campaigns to report this year. But Joe Dinkin, a spokesman, estimated that the party had 15 people going door-to-door every day for three weeks in Bridgeport on behalf of Moore and Gomes and a half-dozen working a week in Hamden for Elliott. It listed $70,000 in unpaid expenses and $30,000 in contributions: $10,000 from the state council of the Service Employees International Union and $20,000 from SEIU Local 32BJ’s political action committee. Working Families, a labor-funded group best-known for its cross-endorsements of pro-labor Democrats in general elections, endorsed five candidates, but its PAC spent exclusively on the two Senate races in Bridgeport and the one House contest in Hamden. It also endorsed Sen. Terry Gerratana of New Britain and a House candidate, Michael DiMassa of West Haven, who both won. Moore, whose campaign was coordinated by an SEIU employee on leave from the union, defeated Tom McCarthy, the leader of the City Council. Gomes, a former senator who returned to the Senate in 2015 after winning a special election on the Working Families ballot line, beat Dennis Bradley, the leader of the Board of Education. Elliott, a political newcomer who worked on Bernie Sanders’ presidential campaign in Connecticut, announced his candidacy in May, shortly before Sharkey announced he would not seek re-election. Elliott defeated James Pascarella, a town councilman. Lindsay Farrell, the state director of Working Families, said Elliott was one of several liberals the group encouraged to run for the General Assembly in reaction to the legislature’s cuts to services and refusal to raise taxes on the wealthy. “There was a lot of interest from many folks on the left to send a very strong signal to the political class that this austerity approach, the budget cuts and layoffs were not going to continue to be tolerated, and we were going to stand up against that,” she said. In November, the Working Families’ liberal vision for the state will be contested by the state’s largest business group, the Connecticut Business and Industry Association, which has budgeted $400,000 for independent expenditures. It is targeting competitive state House and Senate races with the goal of flipping the Senate to GOP control, narrowing the Democratic advantage in the House and keeping control of state spending and taxes. CBIA played no role in the primaries. Planned Parenthood and two charter school organizations, Change Course CT and Charters Care, also made independent expenditures to promote or oppose candidates for the Democratic nomination in state Senate and House races. Planned Parenthood spent $14,683 on four mailings, two each for Moore and Gerratana. Gerratana won with 67 percent of the vote over Sharon Beloin-Saavedra, a school board member. The charter school groups focused much of their late spending on workers and direct mail to help Stallworth defeat Pereira, an education activist and one of the region’s most outspoken opponents of charter schools. Stallworth won with 52 percent of the vote, 929 to 845. Charters Care spent $12,584, mostly for dozens of $60-a-day canvassers who helped turn out the vote for Stallworth in Bridgeport and Rep. Terry B. Adams of Stamford. Change Course CT, an affiliate of Democrats for Education Reform, spent $21,555, first polling on races in Bridgeport and New London, apparently concluding that Stallworth was most in need of help. It arranged for a late direct mail campaign on Stallworth’s behalf by SKDKnickerbocker, one of the nation’s pre-eminent political consulting firms.